What Day Of The Week Was April 2? 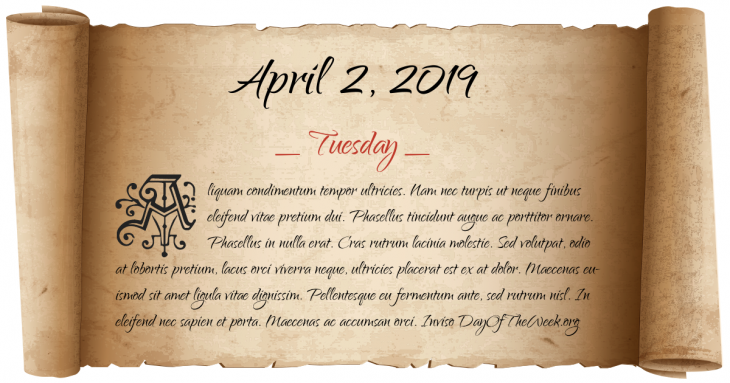 April 2, 2019 was the 92nd day of the year 2019 in the Gregorian calendar. There were 273 days remaining until the end of the year. The day of the week was Tuesday. Napoleonic Wars: Battle of Copenhagen – The British destroy the Danish fleet. As the World Turns and The Edge of Night premiere on CBS-TV. The two soaps become the first daytime dramas to debut in the 30-minute format. The first official Panda crossing is opened outside Waterloo station, London. The Liberal Movement breaks away from the Liberal and Country League in South Australia. President Jimmy Carter signs the Crude Oil Windfall Profits Tax Act in an effort to help the U.S. economy rebound. Soviet leader Mikhail Gorbachev arrives in Havana, Cuba to meet with Fidel Castro in an attempt to mend strained relations. In New York, Mafia boss John Gotti is convicted of murder and racketeering and is later sentenced to life in prison. Islamist terrorists involved in the 11 March 2004 Madrid attacks attempt to bomb the Spanish high-speed train AVE near Madrid. Their attack is thwarted. Who were born on April 2?